Should you swap your wrist-based monitor for one that lives on your forearm? I know a lot of people hate wearing heart rate monitor chest straps. I'm not one of those people, but I can fully appreciate why they don't have a lot of fans. While they are still regarded as the gold standard for accuracy, there's no getting away from the fact that they can be uncomfortable to wear underneath your gym or running kit, whether you're going for a run or sweating bucketloads in your spin class. It's the main reason we've now seen HRM sensors crop up in fitness trackers, smartwatches, sports watches and even headphones. Delivering heart rate data from a more comfortable place, ideally without sacrificing the accuracy you get from a chest strap. The problem is that these wrist-based or ear-based monitors, while less invasive, do still have an accuracy issue. Things are getting better, but there's no getting away from the fact that for certain activities or exercises, they still just don't cut it. Wahoo has never launched a wrist (or ear) based heart rate monitor, so with the Tickr Fit it's entering new territory. The heart rate monitor that sits on your forearm uses similar optical sensor technology to that found on the Apple Watch and Fitbit's wearables. Why the forearm? It might well have something to do with the a company that successfully brought heart rate monitoring to this part of the body a few years ago and actually managed to deliver accuracy on par with a chest strap. Scosche and its Rhythm armband was first on the scene and now both Wahoo and Polar have decided to offer something similar to prove that optical heart rate sensors can deliver the goods. So, has Wahoo managed to pull it off? We've been putting the Tickr Fit through its paces in the gym and out running to find out if monitoring heart rate from the arm could be a genuine option for chest strap haters. But before getting into the accuracy chat, there's something we need to talk about first and that is comfort. The Tickr Fit could be super accurate and reliable, but if it's as irritating or chafe-inducing as a chest strap can be, then it's ultimately failed its job. Thankfully, that's not the case with the Fit. What you get in the box is the small rectangular heart rate monitor with the optical sensor on the back and a solitary blue button on the side to turn the device on and off. That's accompanied by two stretchable, adjustable, perforated straps (small and large) that are held around the forearm with velcro. It's extremely light, the strap doesn't feel too tight around the arm and you barely notice it when it's on. That's not to say that it's not entirely without its issues. I did find that on a few occasions when I wore it underneath a running jacket on a rainy run it did have a habit of slipping out of place. It did also experience a few instances when it would move down my arm during a weights session. So maybe it could benefit from something sturdier in place of the slightly feeble velcro strap that's currently charged with keeping it in place around your arm. The Fit is at least sweat-proof and water resistant (up to 5 feet) but unlike the new Scosche Rhythm24 HR armband, it does not offer heart rate monitoring while you're swimming in the pool or out at sea. When you're ready to get tracking, the good news is that it's as straightforward as most dedicated heart rate monitors. Plus, it has Bluetooth and ANT+ connectivity support, which means you can connect it to a range of watches, smartphones and GPS bike computers (including Wahoo's own, naturally). The Fit does work with a bunch of fitness apps like Strava and Runkeeper, but we decided to focus on using it with Wahoo's own Fitness app. This is one of the most basic, streamlined fitness apps out there and once you've gone through the painless process of adding the Fit, you're ready to go. I tried it out on an iPhone 6 and a Pixel 2 XL and had zero issues pairing it or switching between the two handsets. The LED light on top of the monitor flashes blue to indicate that pairing is successful and will also flash red after a session has been recorded when the battery is running low. You should expect to get around 30 hours of training done before you need to reach for the proprietary charging cradle that clips onto the back of the device. So how did it perform? I focused mainly on using the Fit for running because then I could test it in the same way I have tested other heart rate monitoring wearables. I could take it out on slow paced runs, something more high tempo and also see how it fared where most wrist based monitors seem to fail: high intensity training. With Polar's H10 chest strap as the barometer for accuracy, I was pleasantly surprised to see how well the Fit fared. The data below is from a moderately intense treadmill run that did involve some intervals. You can see a 1-2 BPM difference in heart rate average and max readings, which was pretty much consistent with what I found in my testing. The only abnormally high score that registered occurred when I wore the Tickr Fit underneath my jacket and it moved out of place. Aside from that incident, it proved very reliable. Then I decided to crank things up for some high intensity training, where I was fully anticipating to see some of the same issues I'd encountered with wrist-based heart rate monitors start to creep in. Surprisingly that wasn't the case at all, as you can see from the screenshots below. On another, more intense treadmill run, there's just a 1 BPM difference for heart rate average and max heart rate data. The heart rate graphs also paint a similar story of the session, although times spent in heart rate zones don't entirely match up. What I did also find interesting was the data recorded for calories burned. In pretty much all of the tests, the Tickr Fit provided a higher number than the chest strap, roughly 50-100 calories more on hour long sessions. 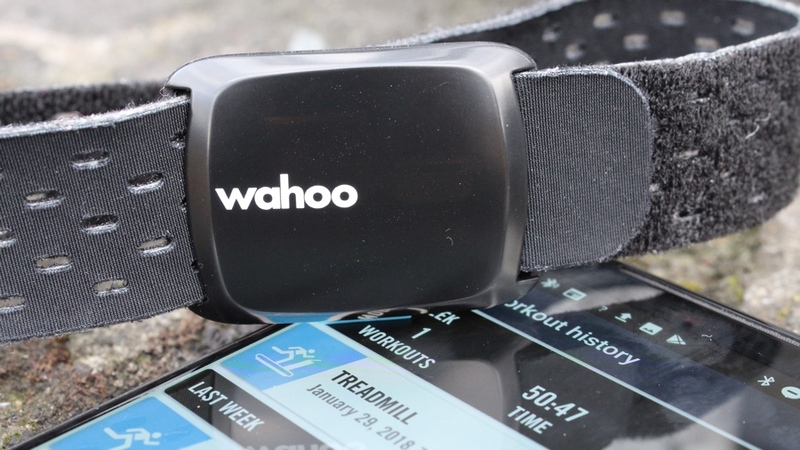 Like most heart rate monitors, Wahoo uses its own software algorithms to produce that calorie burn data so while it was roughly in the same ballpark as the H10's data, some may well question if that information is wholly reliable. There were two things that I hoped the Wahoo Tickr Fit would deliver. The first was that it would be more comfortable to wear than a heart rate monitor chest strap. Secondly, that it would provide reliable and accurate data. Based on my time with the HRM armband, it delivered on both of those. While I think there could be some minor tweaking done with the armband design that could make it more suitable for a greater range of exercises, there were no chafing or discomfort, and on the whole it doesn't get in the way of your workouts. Crucially, the accuracy is there as well and the support to collect that data in a host of apps and to pair with a host of devices is a big plus. The question is whether it offers a better package of features in comparison to the alternatives. The Polar OH1 (review incoming) is roughly the same price and does offer onboard memory to store workouts, along with a slimmer and more discreet design. The Scosche Rhythm24, which launches later this year with the ability to track heart rate on land and in the water, brings something that neither the Fit or OH1 offer as well. If you really hate chest straps and don't trust the wrist based ones, the Tickr Fit doesn't disappoint. Just keep in mind that you might be able to get a bit more for your money if you go for the Polar OH1 or hold out for the Rhythm24. Does your phone (iPhone for me) need to be paired and within "range" for it to track or can I leave my phone in a locker (not in the same room) and then go and do my workout?